You can find the transcript from last months chat here and older transcripts here. Sometimes tracing down the build problems caused by wrong configuration files (platform.bib/.reg/...) is hard due to lot's of IF-ELSE-ENDIF statements (see an older post: "Strange build error message"). Last time I was bugged by a totally messed up configuration file and therefore I wrote (better say 'hacked') a little perl script that just lists the nesting level of each IF, ELSE, ENDIF statement. If you have been reading Jochens posts about Windows CE 6.0 R3 with interest then I'm sure you will not want to miss todays Webinar: "Introducing Windows Embedded CE 6.0 R3". David Wurster, Senior Product Manager, will introduce and explain all the new features R3 incorporates and answer any questions you may have. So what are you waiting for? Register here. Windows Embedded CE 6.0 R3 is to support Microsofts Windows 7 Device Stage Technology through a QFE, available by the end of this year. This will allow CE Devices to leaverage the new Windows 7 functionality and to smoothly fit into your device management. But, what is everybody else doing? Just twiddling their thumbs? I can assure you some are really busy at the moment. AUG Elektronik - home of the AMI Board - for example, have been busy making their SDK available as a Beta for their customers to try out the new features. Have a look at the news here. I'm really looking forward to all the devices available when .NET MF 4.0 is released in ... oops don't want to tell too much. Today I am going to talk about the last update in Windows Embedded CE 6.0 R3 namely some third party applications. The next of the new 3rd party applications to be included into Windows Embedded CE 6.0 R3 is the instant messaging client Tencent Mobile QQ (version 1.0) which is very popular in China. As already stated in my post about the new Internet Explorer Embedded, Windows Embedded CE 6.0 R3 now offers support for Adobe Flash Lite 3.0 which is an ActiveX control for Internet Explorer Embedded that supports playback of animations or videos that are compatible with Adobe Flash Player. 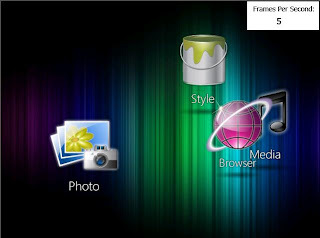 Adobe Flash Lite 3.0 comes with the Windows Embedded CE 6.0 R3 installation and therefore does not need to be installed separately. Bubbles and Carousel both load with a default screen resolution of 800x480. In order to include XamlPerf to your OSDesign you need to add the SYSGEN_SAMPLEXAMLPERF sysgen variable. You will find that this sysgen variable is NOT part of your catalog; but that you have to set is manually. To do so, simply add it as an environment variable from the Project->Properties dialog from within the PlatformBuilder UI. Upon rebuilding your system you will get shortcuts for the Bounce, Bubble, and Carousel XamlPerf on your devices desktop. The source code for the XamlPerf sample application is available under _PUBLICROOT\Common\Oak\Demos\XamlPerf whereas the XAML files can be found under: _PUBLICROOT\Common\Oak\Files\XamlPerf. On your device the XAML files reside under \WINDOWS\XamlPerf\. Today I would like to talk about the new Connection Manager that comes with Windows Embedded CE 6.0 R3. As you have most probably already read, it has proven its abilities under Windows Mobile and it is responsible for managing access to data connections and handling interactions between voice and data connections. To include the Connection Manager into your OSDesign you need to add the SYSGEN_CONNMGR variable from the catalog. The great benefit of the Connection Manager is that it separates the details of network-connection settings from application code. The Connection Manager is therefore the central module which automates both the establishment and the management of network connections and thereby simplifies the connectivity. So when developing an application you only need to know which network (connection name and network name) to connect to. All the details involved to establish and manage that specific connection are performed by the Connection Manager. You can simply use the Connection Manager API to integrate the Connection Manager functionality into your application. as promised I will now talk about the new sample Internet Explorer which uses Silverlight for Windows Embedded. In addition to the features of the regular IESAMPLE it also has a tiling engine which supports Touch Gestures (if supported by your OSDesign), better graphical performance with hardware acceleration, as well as scrolling and zooming. By default, a web page will load to fit your screen width. You can find the source code that handles zooming under _PUBLICROOT\IE\OAK\IESAMPLE_EXR\UI\ZoomController.cpp. The following two screen shots show the IESAMPLE_EXR application in non-full-screen-mode and in full-screen-mode. The application loads in non-full-screen-mode so you can type in the URL you wish to navigate to. Upon single tap, IESAMPLE_EXR changes to full-screen-mode. Did you notice the two/three buttons on the right hand side? The upper two buttons are for zooming in and zooming out while the third button allows you to exit the full-screen-mode. As you can see there are also some navigation and settings buttons at the bottom of the window in non-full-screen-mode. 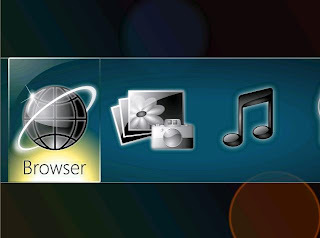 You can use Silverlight for Windows Embedded to customize both functionality and UI of IESAMPLE_EXR. Use the IESAMPLE or IESAMPLE_EXR container applications as a starting point. The IESAPLE_EXR supports Silverlight for Windows Embedded which is based on both C++ and Microsoft Silverlight 2 XAML. I will talk about the IESAMPLE_EXR sample browser in a separate post. As previously posted Windows Embedded CE 6.0 R3 now supports Touch Gestures; single-touch gestures to be precise. Pan: press, then drag your finger; this represents a mouse move event. The gesture recognizer sends at least one GID_PAN followed by a GID_END after lifting the finger. But how does your system know that you just performed a Touch Gesture? Upon a touch event the touch driver passes an array of touch points through the gesture engine to each registered gesture recognizer. When a recognizer identifies a gesture, it adds the corresponding gesture event into the same message queue that receives the touch events. However, to allow the window procedure to process a gesture and if desired cancel actions normally executed upon a finger-up touch event, the gesture engine always delivers gesture events before any final finger-up event. In addition, you can also use the window auto gesture API set in any standard scrollable Win32 window that is created with the WS_HSCROLL or WS_VSCROLL styles to enable automatic handling for pan and flick gestures with the help of the central physics engine. Now, I bet, you would like to know if there is some sort of demo that you can simply use. Well there is: you can use the new sample Internet Explorer (IESAMPLE_EXR) which in addition to supporting Touch Gestures also uses the new Silverlight for Windows Embedded. The 2009 Embedded Partner Excellence Awards for EMEA are being awarded next week during the Channel Summit in Edinburgh. So stay tuned to find out who the winners are and of course for any other news from that event. Windows Embedded CE 6.0 R3 now available for download!